of flowering annuals or hanging baskets. Larger plants can . . . 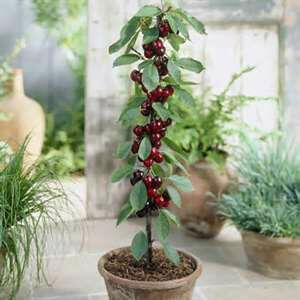 Planting trees in container gardens is just like planting anything else except your plant and your container are larger. compact root systems. Don’t choose varieities that drop lots of seeds, leaves or messy fruits during the growing season. They will keep your patio, deck or balcony a mess. variety that is suited to your climate and the growing conditions in your garden areas. remain outdoors year round excdpt in mild climates. If you live in an area with cold winters, you will need to move container trees to protected areas. especially evergreens – require less food and nutrients than trees with broad leaves. They also adapt better to the restricted root area of containers. 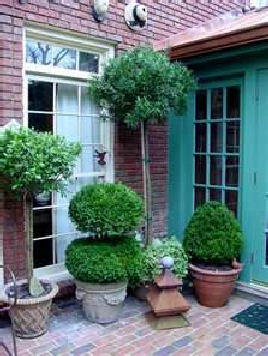 Pines and junipers grow well in dry soil which is common with container gardens. 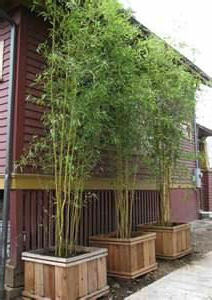 Bamboo trees (to the left) grow quickly in containers and make great privacy screens. 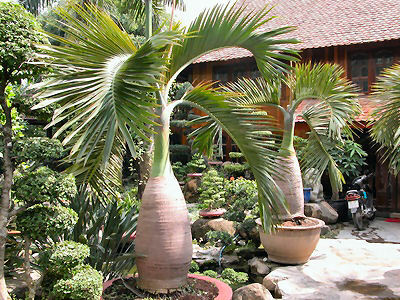 Add a topical flair to your outdoor areas with palm trees. 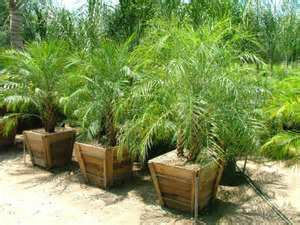 Check out smaller palm varieties that work great in containers. Know your climate zone. The roots of trees in container gardens are more exposed to temperature swings than those planted in the ground. Many experts advise that you plant varieties that will live in one zone colder or warmer than your own. You can also move containers to a protected area during the winter if you want to plant types that won’t do well in extreme cold or heat – just make sure you have a way to move the pot if it is heavy, or keep it on rollers. The National Gardening Association is a fantastic resource. You can find recommendations at garden.org. up and bagged in the burlap. through the drain hole in the nursery pot. itself around the root ball. three years to get it to the point where it looks nice from all sides. doesn’t have broken tips or branches, split root balls or damaged bark. container’s rim and feel moist to the touch. 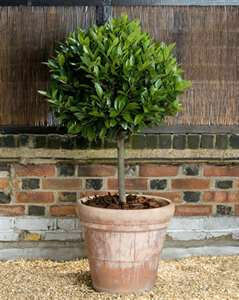 Once you’ve decided on the tree, select a pot that is the right size. 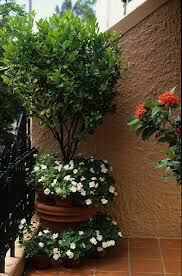 Trees in container gardens should be planted in a pot or box that is twice the width and depth of the root ball. 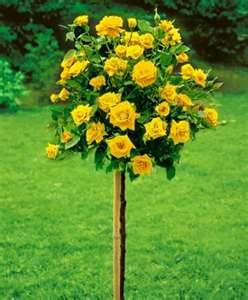 A rule of thumb is to have a foot in container diameter for every 4 feet of mature plant height. susceptible to killing winter frosts. Underplant your trees with flowering or vining annuals or perennials for some color. top rim of the container. stake or two, do it at planting time. mild areas, any time is okay. 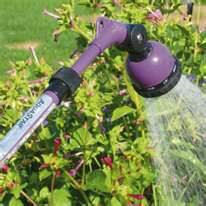 Watering is a concern for all potted plants, including trees in container gardens. When it gets dry, a tree stops growing. Even large containers with too little water and nutrients will stunt or dwarf the plant. show signs of needing water every day, it needs to be moved to a larger pot – one about 4 inches bigger in diameter should be enough. Regular maintenance is fairly simple. Keep suckers and stray stems trimmed, and keep a nice shape. Prune after blooming, or in fall in most climates. In the spring, remove the top 1-2 inches of soil from the container and replace it with fresh potting mix. Add fertilizer to the mix when you do this. Below are some of the best trees to try in your container gardens as recommended by the experts. If you are interested in fruit trees for edible gardening, please visit that page too. and act like trees. Their lower branches are removed to form a trunk. For additional plants that will add form and permanence to your garden areas, go from Trees in Container Gardens to Shrubs in Container Gardens.